The tropical whipworm Trichuris trichiura infects around 500 million people around the world every year, causing diarrhea, malnourishment and developmental problems. At the moment there is no vaccine, and treatments are expensive but pretty ineffective. To find new ways to tackle whipworm infection, scientists at the Wellcome Trust Sanger Institute in Cambridge have been busy delving into the whipworm’s 15,000 genes, sequencing and annotating the parasite genome. But it’s a huge task they can’t do alone, so they’ve enlisted A level students from more than 60 schools across the UK to help out. Kat Arney spoke to lead researcher Maria Duque to find out more. Maria - We were very lucky to being told with our collaborator in Denmark, Dr. Peter Nejsum who has infected himself with this parasite. This allowed us to get access to very good material because we can receive the adult worms that actually he had in his intestine and we could sequence that materials and generate and generate a new version of the genome which is much more complete. So, we need to identify where and which had the genes that compose the genome and it is in this endeavour that we look for help from the students, want them to participate to really find out where the genes are. Kat - So let me get this straight. You have a researcher who has infected himself with this parasite so that you can get the DNA from the parasite and try and assemble all the genes together. Maria - Yes, but his original objective was actually not to give us the parasite material. He unfortunately has a disease that is called psoriasis. As an alternative treatment, he infected himself with this parasite to decrease the symptoms of this disease. Kat - Why do you need to get so many children involved in this project? 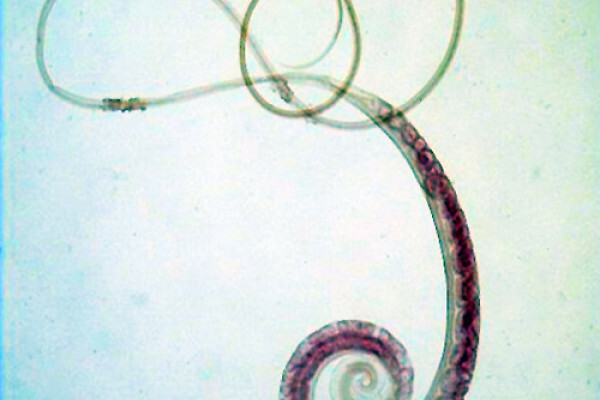 Maria - Because the genome of the parasite of the human whipworm has around 15,000 genes. So with genomes, you can actually annotate the genes using computer’s algorithms that automatically will tell you which gene is and where the gene is. But unfortunately, when you use computers, the programs cannot really go into the very difficult genes and manually curate the genes. So it’s here where humans are required to really have a very good assembly of the genome to really annotate the genes with precision and it’s here where having a load of students would really help us. Kat - Something like annotating a genome saying that this is that gene, this is this gene, that seems like something that’s pretty complicated. How are school children able to do this? Maria - You have a piece of sequence that is just a mix of letters which would be ACGT but then it’s making sense of what this sequence is telling you. So, how can you say in this point of sequence, you actually will have a gene starting and terminating, and how this gene is composed. So they will be using software called Apollo, they can see the DNA sequence on the upper part. And then they can see the evidence of the genes that means the data that we have obtained after sequencing the RNA. And it’s this sequences from the RNA that gives you clues in the structure of the genes. So, it’s not about which gene is what, but how the gene is composed and how it’s organized. Kat - So it’s working out kind of what's the important stuff and what's not that important. Kat - Why do you need to annotate this genome? What are you going to do with it once you’ve got all the ins and outs, the bits and bobs of the genomes sorted out? Maria - Having the genome of a parasite or a pathogen is very important because when we do experiments to understand how the parasite infects and how it actually causes disease, this is all due to proteins that are expressed by the parasite and understanding which gene actually is coding for that protein then allows you to do additional experiments. For example, to remove the gene from the genome of the parasite and then study what happens with the parasite when it’s a lack in that gene. We are now able to move forward into the studies of this disease without having a proper version of the genome so that we can understand in detail how the parasite invades the gut and how it causes disease so that understanding which genes are clues, we can develop new drugs and vaccines to fight the disease. Kat - It’s wonderful to think that a load of British school children could be behind a new treatment for a tropical disease. Maria - Yes, that’s great. It’s good to inspire the new scientists and to know that being given this experience actually promotes as they come into science. But they know there is something else behind annotating the genome. There is actually a cause behind that we really want to fight this neglect tropical diseases. And for us, it’s really important to get their help. Kat - That’s Maria Duque from the Wellcome trust Sanger Institute, and you can find out more information about the whipworm project here. Next What makes a mammal? Do you want to know what's in your DNA?